Solar Lighting, Home Security Systems, Digital cameras, Electronic Cigarettes, E-CIG, MODS, Vape, Vaporizer, GPS, Digital calipers, calculators, electronic clocks, medical equipment, measuring instrument, sensors, radio transceiver, and many other electronics. 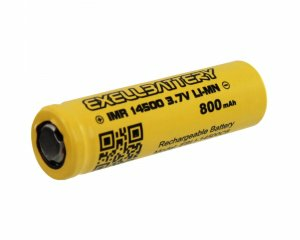 EXELL BATTERY EBLI-14500C8 is an ideal replacement battery for many of todays in demand applications such as E-Cigarettes also known as MODS, Vaporizers or Vape products as well as high intensity LED flashlights and Solar Lamps used in gardens and walk ways.This LiMN battery has three-dimensional tunnels that enable rapid diffusion of Li+ through LiMn2O4 particles, and therefore lithium-ion cells made with this material can have better theoretical drain rate capability. Conventional lithium-ion cells use LiCoO2 or variations of that material. Cells with LiCoO2 cathodes are typically designated with the term "ICR". The LiCoO2 type materials have a layered crystal structure that only enables 2D diffusion within the layers, so the overall Li+ diffusion rate is slower. Li-MN batteries have a lower crystalline density and therefore a lower inherent capacity (mAh/ml) than LiCoO2. If you do a direct replacement of LiCoO2 with LiMn2O4, the capacity of the cell will be reduced by ~15%. But here is the interesting thing: simply doing a direct replacement with LiMn2O4 will not significantly increase the rate capability of a cell. In order to get a real increase in rate capability, you need to design a cell with higher electrode surface area and thinner electrodes because Li+ diffusion in the cathode particles is not the only bottleneck to getting current out of the cell. Using thinner electrodes further reduces the capacity of the cell because you will have a higher fraction of "inert" materials like the separator and current collector. This is why IMR cells typically have ~40% lower capacity than their ICR cousins.